Dragos Campean is a surveying engineer who transitioned to a new challenge in the field of testing in 2015. The primary activities he is involved in are manual testing, API testing, UI automation and performance tests, with a particular inclination to the latter when the context allows it. He is also drawn to teaching and is currently working on trainings, tech-talks and workshops at Evozon Systems, where he is employed. Restful APIs have increased in popularity over the last few years. The trend started with giants like eBay and Amazon. This has happened because these types of APIs present multiple advantages. Some of these benefits are: good performance in component interactions, scalability, simplicity, portability and reliability. For these types of APIs, JSON files are the default choice for formatting transferred data. These types of files are easy to read and write and can be used with any popular programming language. As testers, API testing is something pretty common in today’s industry. These tests are performed in the message layer, since APIs lack a GUI. In a typical scenario, your team decides whether to integrate an API or design one. Before the integration with the UI is complete, the API needs to be tested. Thus, you get access to endpoints that you try various scenarios on: sending a set of parameters and asserting that the response contains the expected data. This is the most basic scenario for an API test. Besides the case presented above, API tests can have various requirements, depending on the nature of the project and task. One requirement I have come across recently, sounded something like: ‘We have 2 (or more) APIs. We need to check if the keys for an endpoint on API1 are exactly the same as the keys from its equivalent endpoint from API2. ‘The same’ means that the name, order and number of occurrences of each key must coincide.” The order of the of the keys in a JSON would normally not be relevant, but we will see why I mentioned it in this context. The most basic solution would be to use an online JSON comparer (like this one or this one). This would imply though that you have to manually input the responses of the endpoints under test in the online comparer and repeat for every endpoint. Not too elegant if you ask me. Also, inefficient if you have to do it for hundreds of endpoints. Another approach is to use various Java libraries that can handle these types of tasks, like Jackson or GSON. This approach asserts if 2 JSON responses are the same. Then you can elaborate on this starting point to check more complex scenarios. Another viable solution is to use the JsonSlurper from Groovy which parses text into a data structure of lists and maps. 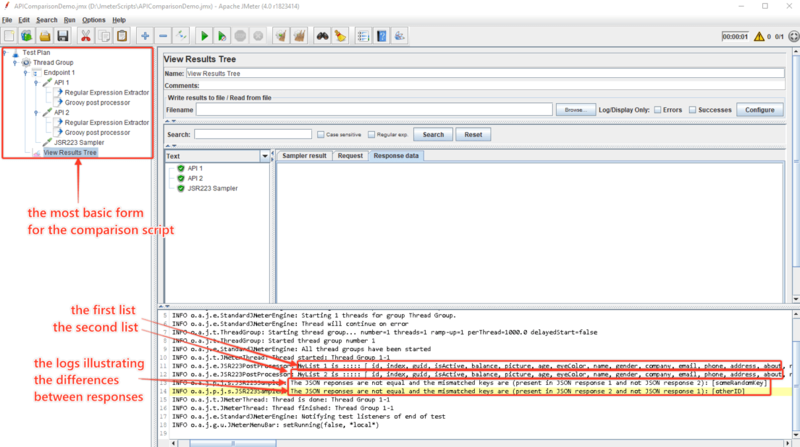 And, of course, there is the Apache JMeter™ solution. The JMeter approach: for the situation I presented, the API calls were already defined in the JMeter application, so it was more convenient to integrate a solution into the existing tests. The idea was to build on the existing foundation, using elements that are familiar to most JMeter users. The first idea which comes to mind is to use the JSON Path Extractor post-processor. When it comes to extracting values from a JSON file, the JSON Path Extractor would be the optimal solution. In this situation though, for the scenario I presented where we only need to compare the keys, this type of post-processor is not a viable solution. This is because we don't have a JSON schema for the endpoints. Also, we don't know exactly which keys each API call contains and keys are part of the JSON Path we need to formulate. This is why, for this specific situation, we are going to use a slower and less optimal solution: the Regular Expression Extractor. For this, minimum knowledge on regular expressions and a bit of Groovy code is required. First, let’s try to visualise the structure of the JMeter script. Inside a thread group, there are multiple Simple Controllers, each corresponding to a group of similar endpoints that we need to compare the keys for. Inside each Controller, there are multiple (2 or more) calls to the exposed ‘sibling’ endpoints. Since we want to compare if all keys from the API1 JSON response are found in the responses of API2 and API3 calls, the first step is to extract them. This is done using a Regular Expression Extractor. The expression would be "(.+?)":. This could be translated as: match any character (the dot) except for line terminators, between one and unlimited times between the characters “ and “: literally (case sensitive). In theory, this would extract all key names since in a JSON structure, any key is preceded by a “ character and followed by the “: characters. Then comes the corresponding value which can be (but not necessarily if the value is for example, numeric or boolean) encapsulated by doubles quotes (e.g1: “key1”:”value1”, e.g2: “key2”:value2). Thus, for 2 endpoints with similar responses API1 and API2, after applying the elements above we would have 2 lists of keys: myList1 and myList2, each with jsonKey_1, json_key 2, etc. The debate whether the order of the keys should be taken into account or not comes into play here. Using this regex approach, if we compare two JSON responses with different structures (which contain arrays), and the order of the keys is not calculated, the two JSONs that are different will be seen as ‘equal’. The reason is because this approach doesn’t extract the array as an object, it just fetches the keys and puts them in a list. 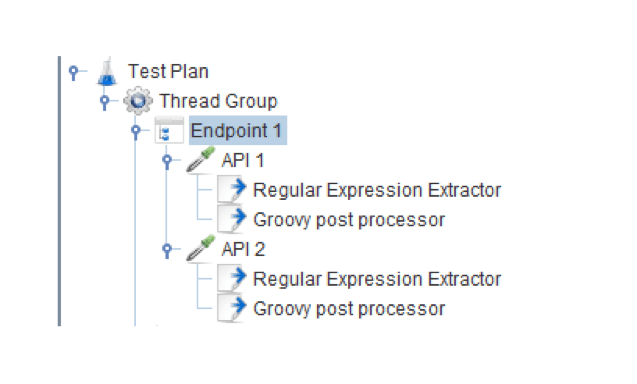 The sampler should be the last element in an endpoint group. This is because the code needs to be executed only after we have created the lists that we want to compare. The first 2 if conditions check if there are any extra elements in either of the lists. The last “else” statement prints out a message that the key order is scrambled even if the keys are the same in all JSON responses. A demo script for the situation above can be downloaded from here. So, for example, if we want the test to be ‘Successful’ only if the keys are the same, we would have to add ‘SampleResult.setSuccessful(false)’ in the ‘else’ statement. If the order of the keys is not important, we would add another ‘SampleResult.setSuccessful(true)’ line of code, nested in the last ‘if’ statement of the JSR223 Sampler. If you want to use the script from the demo on your project you would just have to replace the Dummy Samplers with actual requests to various endpoints which you want to compare. We can do this comparison for as many API calls as we want. To avoid having to write too many if statements, for that situation, you can transform the “if-else” statements above into something more general. If we want to check all the key:value pairs to be equal in all responses we could do that as well, we would just need to change the Regex expression to "(.+? )": (.*). But if this is the case, I would recommend using one of the approaches presented at the beginning of the article since the one with JMeter isn’t very elegant. The conclusion is that there are always multiple approaches to a task. Sometimes you take the hard road with the purpose of learning something. Other times you use the tools in your arsenal which help you attain your goal as soon as possible and move on to the next challenge. It’s all about perspective. After creating your JMeter script, you can upload your JMX to BlazeMeter. Use BlazeMeter if you want to scale your test, collaborate on the test and results, share reports with managers and improve agility. To try it out, just put your URL in the box below and your test will start in minutes. Or, request a live demo from one of our performance engineers.